Dallas - An American Airlines flight attendant says she was mortified when a passenger accidentally bumped her and she dropped a tray of drinks on her boss — CEO Doug Parker. 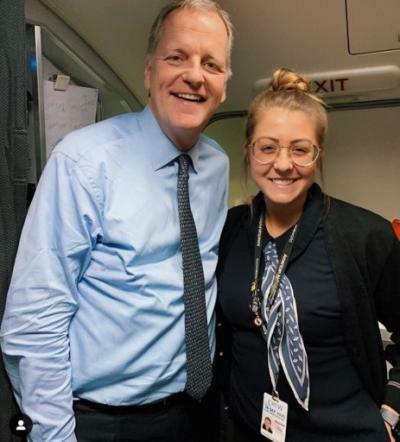 An American Airlines flight attendant says she was mortified when a passenger accidentally bumped her and she dropped a tray of drinks on her boss - CEO Doug Parker. Maddie Peters says she’d never spilled a drink on a passenger during her four years with Fort Worth-based American. That changed on a recent flight from Phoenix to Dallas-Fort Worth International Airport and her first meeting with Parker , who introduced himself to the crew while boarding.